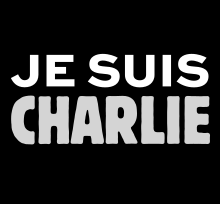 Je suis Charlie is a French slogan. It appeared at the moment of the Charlie Hebdo shooting in Paris. Very quickly it became known all over the world. These three words were never translated and used as French language. It was created by French artist Joachim Roncin. In the English language, it can be translated as I am Charlie. This page was last changed on 9 August 2018, at 06:10.